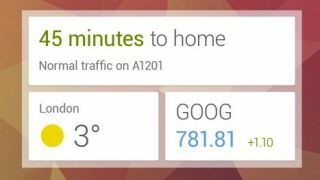 Remember that slippery Google Now widget that appeared then vanished some 24 hours ago? It's back, and this time for good. The G-team announced Wednesday the permanent arrival of the widget that brings all pertinent Now cards front and center on the home or lock screen of your mobile device. The widget, along with a few other additions, are part of an update for Google Search for Android on devices running version 4.1 and above. While it's certainly a convenient addition to the Now crowd, it deflates speculation that such a feature would arrive with Android 5.0: Key Lime Pie. That's not to say there won't be further Now improvements whenever the new OS launches, just that the widget as we saw it yesterday has arrived. Google, which made the widget announcement in an Android blog post, assured that Now is just getting started, so we're sure to see many more updates and improvements hit the pipeline before long. Mountain View wasn't content to leave it at the widget, also unleashing movie cards with Rotten Tomatoes ratings for flicks. When purchasing tickets through Fandango, Google Now will remind would-be moviegoers when they need to leave to make showtime. Plus, it will pull up tickets upon theater arrival. In a less frivolous pursuit, Zillow has partnered with Google to provide house hunters nearby real estate listings and in-depth listing info. Card by card, Now is really becoming a handy personal assistant. Take note, Siri.